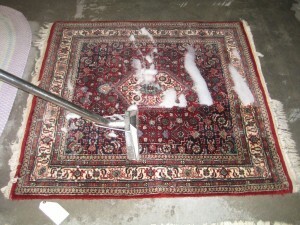 As experts in rugs and rug care we recommend a professional cleaning every 3-5 years or as needed. But if you have an occasional minor spill there are some rug care and cleaning tips you can try at home. Disclaimer: This chart of rug care and cleaning tips is meant as a guide only and we in no way guarantee the use of these cleaning tips will remove your stain and may actually cause the stain to worsen. For best results we recommend you bring your rug in immediately for a professional cleaning. Call 757-333-1010 to get a cleaning quote. Blot up all excess spill with paper towels. Do not Rub. Apply antidote as shown on list with a clean dry cloth, working from the edge to the center. CANDLE WAX: Place a blotter or brown paper bag over the spot. Put a hot iron over the blotter. Wait a minute or so until the wax is absorbed into the blotter. Move the iron constantly and do not let it stay in one place. Repeat if necessary. CHEWING GUM: Press ice cubes against spot. Wait until it becomes brittle and breaks off. Use spot remover to vanish last traces. Saturate the spot with cloth soaked in vinegar or alcohol. INK FROM BALLPOINT PEN: Saturate the spot with hairspray. Allow to dry. Brush lightly with a solution of water and vinegar. Where is my rug cleaned? Is my rug cleaned in your local premises or is it sent somewhere else? 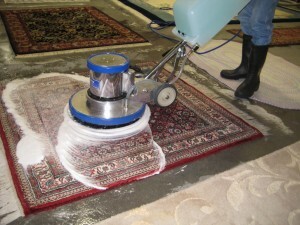 Do you have your own professional cleaning facility exclusively for Oriental rugs? What type of equipment do you use to clean my rug? Does your rug cleaning process use a deep hot water scrub, wash and shampoo? Or just surface spray and extraction? Do you use 100% bio-degradable, environmentally friendly cleaning agents? What will your process remove from my rug? Is my rug insured and secure while it is being professionally cleaned? Do you offer a 100% satisfaction guarantee on your service? We invite you to read more about our cleaning process and watch our short video for yourself before you call. Our rug cleaning video was filmed in our Virginia Beach rug cleaning facility. All work is performed on premises, therefore you are assured of timely turn around. Call 757-333-1010 for more information or to schedule an appointment for a pick up. Proudly serving all of the Hampton Roads cities; Virginia Beach, Norfolk, Portsmouth, Chesapeake, Suffolk, Hampton, Newport News, Williamsburg. We also pick-up and deliver to parts of the Eastern Shore and Northeast North Carolina.